The Ethiopian Children’s Appeal (ECA) is a grassroots virtual charity founded in 2001 by Ms. Jo Elizabeth Butler, former Deputy Director at the United Nations in Geneva, Switzerland. The charity has no offices and only volunteers thus ensuring that 100 percent of all funds raised help about 900 schoolchildren in Sodorre (rural Ethiopia) as well as 18 double orphans who are HIV positive, in the capital city, Addis Ababa. Since 2001, ECA has delivered annually 6,000 notebooks and schools supplies to 900 children at the Melka Oba and Sodorre Schools. Students at the two schools also receive clothing and sports equipment. From 2001 to 2012, the ECA delivered from three to ten tons of locally grown wheat flour and foodstuffs to the Melka Oba and Sodorre schools located in an isolated rural area near the small town of Adama, three hours outside of Addis Abeba. In recent years, it set up an organic vegetable garden at the Melka Oba school and trained the children to grow their own vegetables using composting and environmentally sustainable methods. Owing to lack of water, the garden has faltered and thus a project to bring water to the area is currently underway and supported by the Frederick Rotary Club in Maryland. Frederick high school students are working on a prototype to purify water at a borehole located at the Melka Oba school in Ethiopia. Their work on this prototype was named as a finalist in the Lemelson MIT invention awards. The Frederick Rotary Club is financing a trip to Ethiopia so that the students can implement their prototype at the school. ECA has built six classrooms, two libraries and two teachers’ quarters at the schools in addition to renovating several classrooms and installing water cisterns. The local health clinic was refurbished and solar panels were installed at the Melka Oba School and the clinic. In addition, in 2014 Melka Oba schoolchildren were given solar lamps to help them study at night. ECA contributed to a wonderful effort called “Artists for Charity,” a former organization founded by a young Ethiopian diaspora man and woman. They established a home for 18 HIV positive double orphans and became their surrogate mother and father. Jo Butler has been their surrogate grandmother since 2005 and spends every Ethiopian Christmas (7 January) with them and personally shops for their gifts from their “wish list”. Jo Butler is now solely responsible for the remaining seven students and is supporting them through her fundraising efforts and the generosity of friends. Three granddaughters have graduated from university and one is now in graduate school getting a masters in psychology. Several grandsons are working and living independently. One grandson is studying engineering and two granddaughters are rising juniors in universities in Ethiopia. One granddaughter recently graduated from high school and hopes to be accepted into medical school in the Fall. Jo Butler has created an online store at Etsy.com/Shop/Schoolery. All proceeds support ECA projects. Jo makes most of the designs and has now taught her AFC granddaughters how to make jewelry. Their work is now available at the online store. 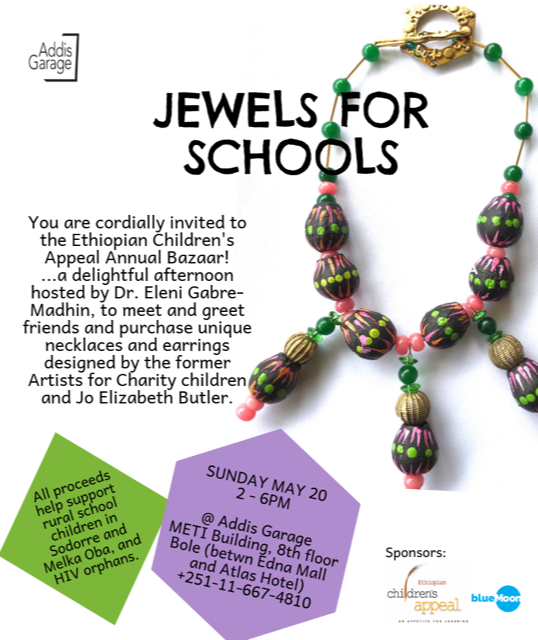 Jewelry fundraising shows have been held in Ethiopia, Switzerland and the United States. Annual deliveries of school supplies, books, nutritional biscuits and other foodstuff grown locally in Ethiopia as well as clothes and sports equipment for rural school children. Built six classrooms and two libraries. Installed solar power in the school. Installed vegetable gardens at the school and taught the children how to grow their own vegetables. Refurbished the local health clinic and installed solar power so that a fridge can store vaccinations. Helped to support 18 HIV/AIDS orphans living in a home environment in Addis Ababa. Providing scholarships to students graduating from rural schools for vocational training and tertiary studies. ECA lost a dear friend and champion this year. The passing of Sue Edwards leaves a space impossible to fill. She was the founder and Executive Director of the Ethiopian Institute for Sustainable Development. She fought all her life to bring organic agriculture to Ethiopia and to the rest of the continent. She was proud of the Melka Oba project and visited the school many times and advised Jo Butler and the community on ways to set up an organic vegetable garden and to treat the environment sustainably so that the community would reap long-term benefits from the land.